Microcosm is a small publisher based in Portland, where zines are du jour and their belief is as refreshing as publishers go. They specialize in DIY (Do-It-Yourself) goods that teach self-empowerment and their website offers up a slice of what they do – from giving out transparent and accessible financial records (their minimum wage is USD$9, capped at $13) and a sliding-scale pricing for all their wares (yes, it’s true!). I’ve requested a couple of books for review, and for those who are very much into DIY (and not just crafts, mind you), I think you might just feel as though you’ve hit gold. Homesweet Homegrown: How to Grow, Make, And Store Food, No Matter Where You Live by Robyn Jasco shows you how easy it is to sustain yourself with a garden. And if you don’t have one, create one instead with the space you have. 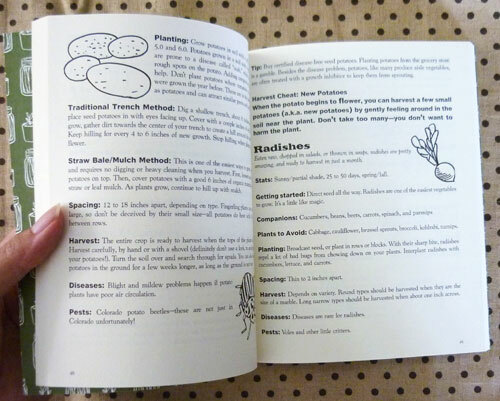 The topics run from the basics: how to cultivate your seeds, irrigating your garden with an old hose, recipes for those delicious freshly picked greens and even the topic of fermentation; with lots of information in between that’s neatly organized between chapters. 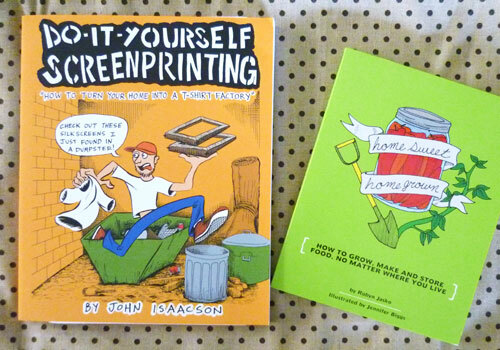 DIY Screenprinting Handbook by John Isaacson is an instructional book on screenprinting in a quirky comic book format. Don’t be fooled by the simplicity of the concept – between these pages (and the strips) there are lots of information that’s delivered with a wittiness that makes it all that much easier to digest. 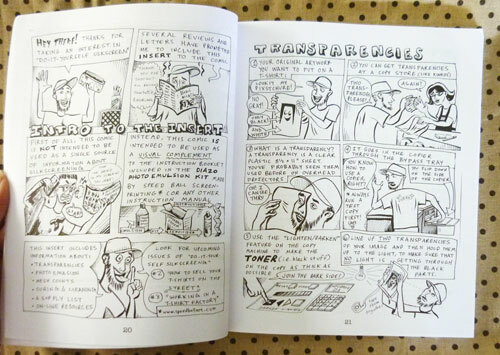 There’s also interviews with other screenprinting artists in between that offers a break in the comic book sequence. The dissemination of textbook information into a storyline – with Isaacson playing the lead role – makes for a lively read out of mere instructions. See more books over at Microcosm Publishing! I’ve been itching to write for the past few days, but I had to hold myself back to make sure that I don’t dip my paws into the website before it’s fully ready. So there’s lots of catch up on, so I’m just going to dive right in with the work of Summer Pierre! Summer Pierre is well-known for writing and illustrating one-page illustrated stories, which occasionally gets published in zine form. Her latest project is 100 stories in 100 days – in which she flexes her muscles further by committing to a daily regime of creating. You can read more over at her blog, or check the collection out over at Flickr. Take-away message for the week: Stretch yourself beyond your comfort zone and exercise those creative muscles! If you’ve been doing the same thing over and over again, why not change things up a little? Whether it’s changes in frequency (like what Summer is doing), or changes in the selection of your subject matter (drawing cupcakes all the time? Maybe it’s time to trade it in for a messy plate of spaghetti!) – don’t be scared to mix it up a little.